Track ends near the end of October, 2018. Stay tuned for date of our last workout of the year. Also keep an eye on the weather as track is not held in freezing, wet weather. It's very clear that coming to the track will improve your race times. Even if you're sure you will never participate in a race, you can benefit from FRCC workouts. These Wedneday night runs can improve everyone's fitness level and are an enjoyable and interesting way to add mileage to your week. The workouts are very "user friendly". 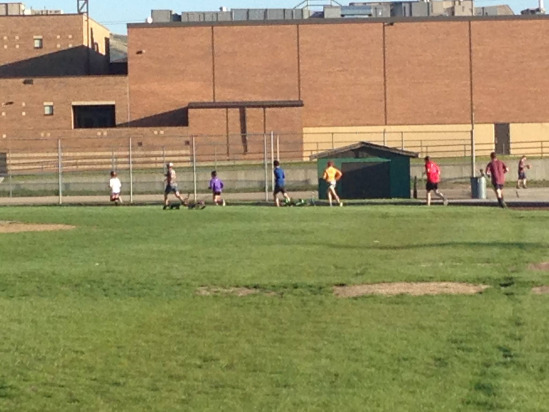 There will be ability groups for you to run in - each has an assigned time for the hard intervals. You can run a 70 sec quarter or a 2:15 quarter and not feel as if you are holding someone up or trying to keep up. Generally the total distance run in a session is 5 - 6 miles. Any workout can be modified to meet your needs. These workouts are designed for EVERYONE. Give it a try...you won't be sorry.